The big game is Friday night! 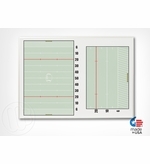 Let us help you prepare to win with one of our high quality football dry erase boards or magnetic prints. 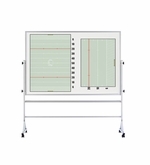 With many options to choose from we have the right solution for you whether it's a handheld dry erase board for the sidelines, a wall mounted board for the locker room, or a roll-up magnet to take on road trips, our football whiteboards will look great and erase cleanly as you teach and prepare your team for victory. "It's not the will to win, but the will to prepare to win that makes the difference" - Bear Bryant. Want to customize your new football dry erase board with your team colors, logo or a different layout? we can do that too; create a custom board or give us a call at 1-877-393-0111 and we can help you along. 12" x 18" Non-Magnetic dry erase writing surface. Double Sided unit. Non-Magnetic football boards with the same great writing surface. 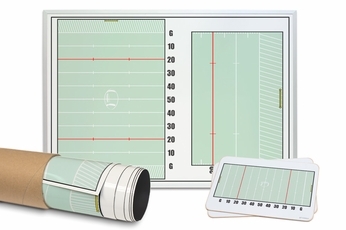 Wall mounted magnetic dry erase board with full field and a blow up of the end zone.